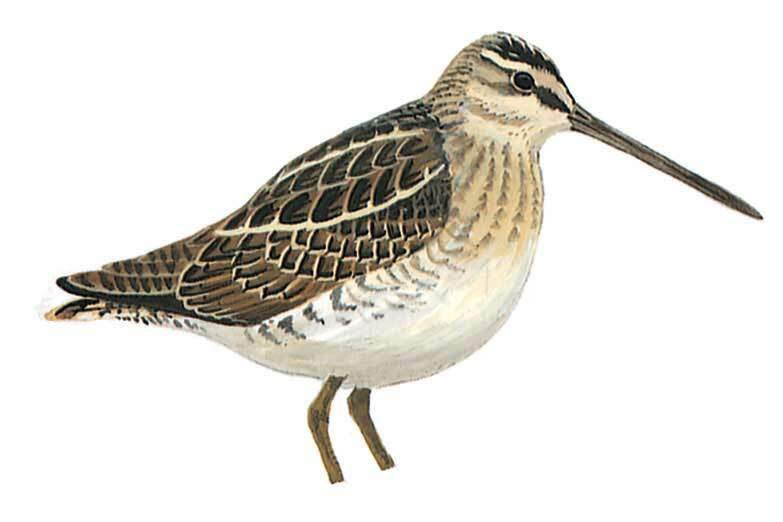 Medium-sized, dark brown wader with distinctly yellow-striped head and upperparts, dark-striped breast, barred flanks and very long bill, with which it probes in mud with vibrating movements. Often squats in low, swampy vegetation, and usually not seen until flushed at 10–15 m distance (at only about 1 m in Jack Snipe); rises explosively, immediately uttering several harsh flight-calls, while zig-zagging to a good height, and usually flies some distance. In flight, shows narrow, but rather sharp, white trailing edge to wings and white belly.